The iPhone is Apple’s hottest product – and for good reason. It’s packed full of little tips and convenient features that seem to gradually pop up over months of use. Apple released the latest version of the iPhone and iPod touch OS (3.1) this week. While it was mostly bug fixes and minor enhancements, there is one feature that got me excited (more on that later). But on top of that, there are some cool tips & tricks left over from 3.0 that weren’t covered in our original article, “9 of the coolest lesser-known features of iPhone OS 3.0 update.” So let’s play catch up first and then get to what 3.1 brought to the table. Mac OS X makes heavy use of data detectors, and now Apple is working the technology into the iPhone and iPod touch. When an email address, phone number, or physical address is added to a note in the Notes or Calendar application, they are automatically recognized and linked accordingly. The email address can be tapped to type a new message, the phone number can start a call, and the physical address can be pressed to view the location in Google Maps. The iPhone logs recent calls in the Phone application by name and then groups them by date. And while it shows those two bits of information at a glance, it doesn’t list how long each call was or exactly when it took place. To view the duration of each call to a certain person on a given day, just tap the blue arrow on the right side of the screen. The next page will display the call times and lengths. It might be obvious to some, but not everyone would think to utilize copy & paste in the Calculator application. And yet, there it is. Pressing and holding the display area of the calculator (towards the top) causes a little popup to show, which allows you to copy the current number into memory or paste a previously-copied number into the app. This capability makes the Calculator so much more practical than in versions 1.0 and 2.0 of the iPhone software. As we all know, Spotlight search functionality was incorporated into the iPhone and iPod touch OS in 3.0. What you may not know is that you can edit what the device searches for and how it is displayed. Going to Settings > General > Home > Search Results brings you to a screen that lets you exclude certain types of content from searches. Plus, using the handles on the right side of the screen, you can drag each category up and down to prioritize your results. The iPhone and iPod touch can be used to email multiple photos within a single message by going to the Photos application, pressing the button in the lower-left corner, selecting up to 5 photos/videos, and then pressing Share. That’s great, but the maximum of 5 photos/videos doesn’t always cut it. Luckily, there’s a workaround. Instead of pressing the Share button, try selecting your desired number of photos/videos and then tapping Copy. Now go to the Mail application and open a new message. Press and hold in the content area, then tap Paste. All of your copied media will transfer over to the email and can be sent off. I should mention that while this method does allow you to send more than 5 photos/videos, it probably isn’t unlimited. There must be some kind of size limit depending on your email service provider. However, I was able to send 19MB of content in one message (7 photos, 1 video). Give it a few tries to see how much you can get away with. This is the feature I was most happy to see in iPhone OS 3.1. 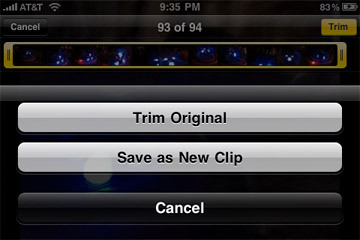 After capturing a video with the iPhone 3GS, users are able to “trim” or edit the video by cutting off some of the beginning & end. The only problem was that, at first, those edits were destructive. When they were saved, the original uncut video clip was overwritten. It actually stopped me from trimming video on the phone altogether. But now with the 3.1 update, Apple has added an option to “Save as New Clip” whenever a video is trimmed on the phone. It really is little things like this that make or break cool features, so I’m glad they made it right. Are there any other iPhone or iPod touch tips & tricks out there?